So I have this table that my mom gave me to put my touch on it. After asking her several times what exactly she wants, she told me that she wants an original me. This touched my heart in ways you may not comprehend. Someone is taking pride in my work. To have a piece of my work out there is amazing to me. So I decided I would go through the process with you. I have so many pictures of this process but lets start with the table itself. (pictured above). 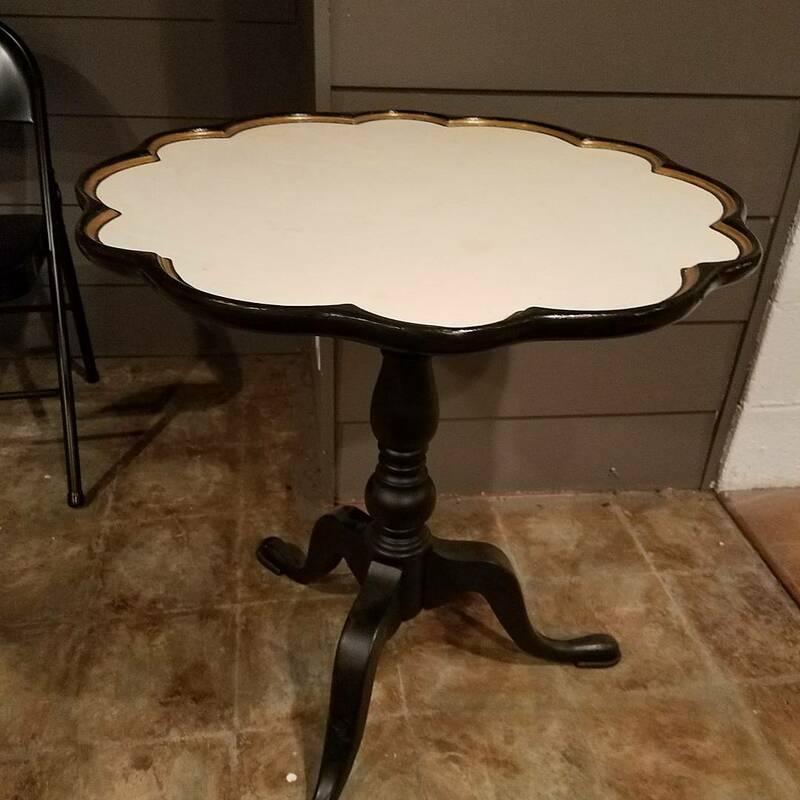 This table was pre-painted with the colors that will be in my moms bedroom, which is where she hopes to keep this table. How am I supposed to actually get the measurements of the scallops since they are different sizes? Well I’m glad you asked! I decided on taping 9 sheets of regular paper together to cover the complete top of the table. After I taped them together I placed the center piece in the center of the table and pressed outward on the paper to give me the size and shape of the top of the table. After I got the correct shape, I started with a pencil and created the grid lines using a pushpin and paperclips since I didn’t have anything that was big enough to give me the circles I needed. I will say that even I was impressed with the way that the paperclips created a perfect circle no matter how far out I went. I highly suggest using this method if you have a large area to work on. It took about three hours to get to this point, from making the paper to creating the grid lines. From there I started to create the patterns that I liked. 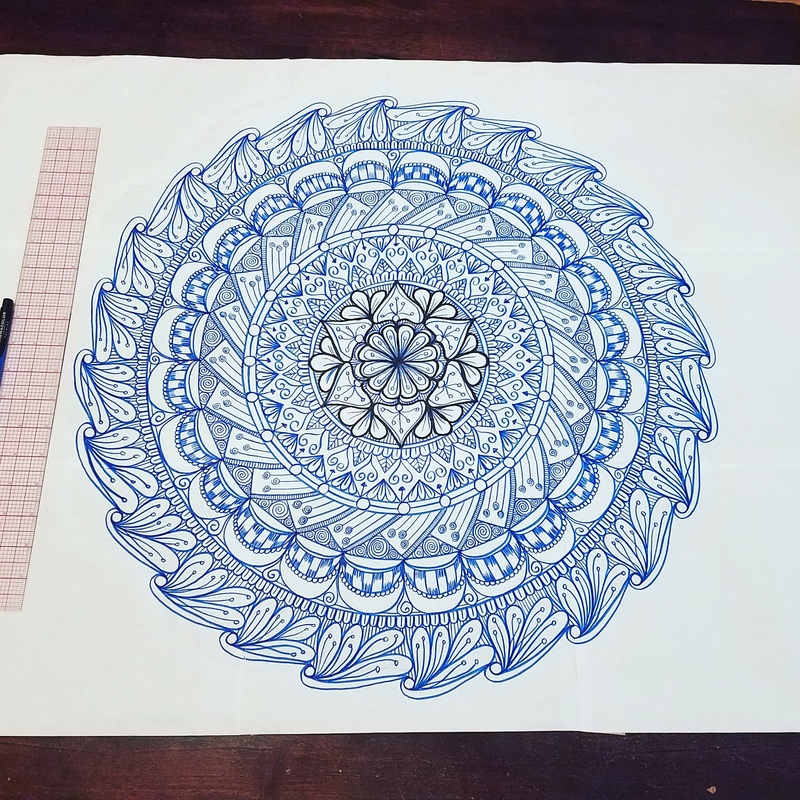 This took another 2 hours to draw out the pattern. Starting the next evening, I began to ink up the pencil drawings. I spent roughly 3 hours on this part as well, changing so much as I went along. Because my art supplies are packed away, the only thing I had to use was a Prismacolor brush pen that was blue. The above image is the end of the second day. 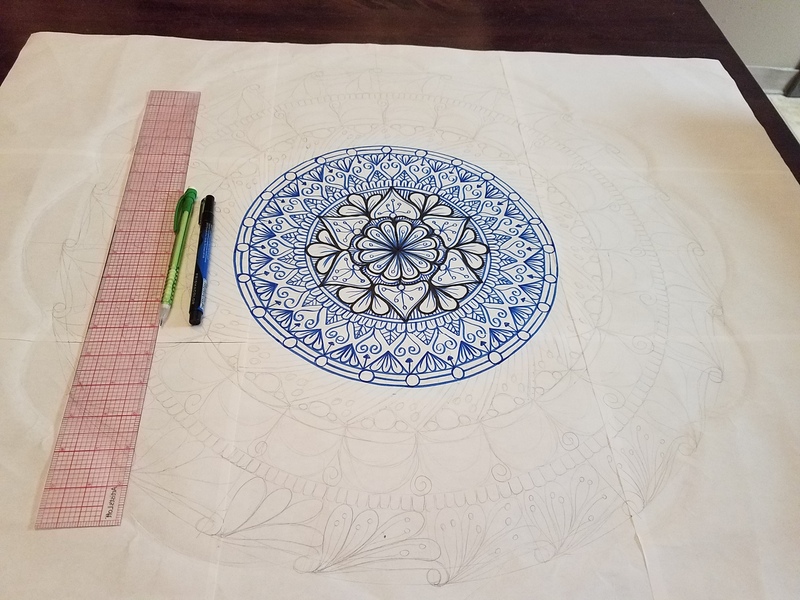 I decided to keep the mandala in reference by taking the picture with the 18-inch ruler I have. Finally, I decided to bring the inking all the way to the edge which was another 4 hours spent on detailing and changing the end product. The point of creating this piece on paper first is because I needed to measure out the full size of the mandala, as well as ensure that the mandala stopped where the scalloped edges started. Once I free-hand the pattern on the table, I will then create the patterns within the scalloped edges at that time. Although this is not the final project, it does show the progression to the point where I am at currently. I have really enjoyed this process and can’t wait until I am able to transfer it onto the table. Look for a vlog on my YouTube channel about different mediums being tested to see how they interact with a protective coat on top. If there is a medium you would like for me to try, please comment below. I will post again when I actually start putting the design on the table. Let me know what you think so far!